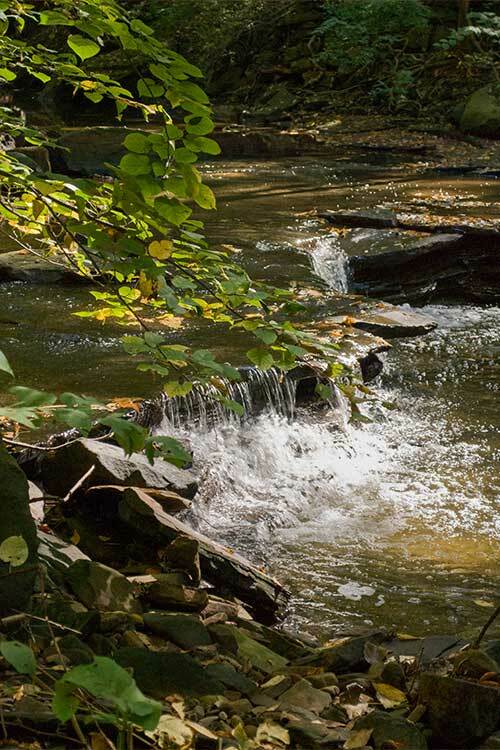 Tucked away amid the urban hustle and bustle of commuters driving through Cleveland Heights and Shaker Heights is one of Cleveland’s little-known natural wonders: Doan Brook. Now bordered by Coventry Road, Fairhill Road, and North Park Boulevard, the 15,000-year-old bluestone tributary to Lake Erie originated as the glaciers retreated from the region. Today, there are hiking trails that meander around the 8.4-mile brook, showing off a bit of Northeast Ohio’s natural state. Yet most people don’t even know these trails exist, says Andrew Klooster, Doan Brook Watershed Partnership’s watershed programs assistant. The Doan Brook Watershed Partnership is hoping to change that. This October, the organization will introduce residents to Doan Brook and the Doan Brook Gorge with a series of educational hikes and a photography class. Klooster says area residents who do know about the trails maintain the area, which traverses down from the Heights toward University Circle. The Shakers probably quarried sandstone in and around the brook, Klooster speculates, with additional sandstone dumped there during excavation when the Baldwin Water Treatment Plant was built in 1923. The result is a babbling brook with occasional waterfalls as it meanders down to University Circle. “One of the natural features is the brook eroding the sandstone as it goes down [the hill],” explains Klooster. On Saturday, October 13, Dr. Roy Larick—a geologist, archeologist, and founder of Bluestone Heights—will lead the first guided tour of the gorge and teach hikers about the geology and human history of the area. Hikers will meet at 2 p.m. at the Fairhill Partners building (12200 Fairhill Road, Cleveland). The cost is $5 and will be collected before the hike. Advance registration is required through the Doan Brook website or by contacting Klooster. Additionally, every Tuesday evening in October, Doan Brook Watershed volunteers Kate Leone and John Reebel will host free guided hikes of the Doan Brook gorge. The focus of these hikes is to expose newcomers to the trails along the Doan Brook and offer a fun, social way to get outdoors for some exercise. The two-hour hikes will proceed rain or shine and depart promptly at 5:30 PM from Fairhill Partners. Contact Leone and Reebel with any questions. On Saturday, October 20, from 9 a.m. to 12 p.m., local photographer David Perelman-Hall will lead a guided hike for aspiring photographers. The group will meet at the western end of Lower Shaker Lake by the bridge near Coventry and North Park, and attendees are asked to bring their own cameras. A $25 donation will be collected in cash or check on the day of the event. Advance registration is required through the Doan Brook website or by contacting Klooster. For those who participate in the photo hike, an optional free digital photography workshop will be held on Tuesday, October 23 at 7 p.m. at Artful Cleveland (2843 Washington Blvd., Cleveland Heights). Klooster says the trails back in this well-kept secret natural sanctuary are mostly maintained by the residents who live around them, and they have done a good job. But otherwise, the area has been immune to the urban development surrounding it. “There’s an entrance at Coventry and North Park and one at Coventry and Fairhill, but it’s just an opening in the greenery and that’s where the trails start,” he says. “There are no signs or anything that point out there’s a trail in there. You can do a nice loop in there. Klooster says hikers should wear good shoes to hike the approximately two-mile loop, which can take an hour to an hour-and-a-half, depending on one's pace. “The terrain is not rout in there, but there are parts that can get a little rocky or muddy if it’s been raining,” he says. All events will occur, rain or shine, but will be cancelled in the case of thunderstorms.